After spending 8+ summers on the campsite in Rüdesheim am Rhein i'm sure i must have seen pretty much everything by now. I'm sure that many people will not agree with my choices of what to see, but have in mind, that i'm not an alcohol drinker, though the area is very famous for their weinbrand, Asbach Uralt, and their homemade wine. The world famous party street in old German style. There is so many cruise ships docking in Rüdesheim only because of Drosselgaße. It is were everything happens in Rüdesheim in the evening. There are live music in all the restaurants and waiters are dresses in lederhosen and and the women looks like milkmaids with their tartan dresses. I must warn you. The activicy on Drosselgaße is all about the cruise ships. If there is no ships, they don't do a big effort about the whole old cozy german style. 2. Bingen Rüdesheimer boat trip "Ringticket"
The area around Rhüdesheim is really wonderful is unlike anything else! So if you are the sporty type (without being too sporty really) then you can buy the "Ringticket". A ringticket is a tour you buy in the office in Oberstraße 37, very close to Drosselgaße. Your tour starts with ride in a cable railway above the wineyards above Rüdesheim which gives you a glorious view about the city and the river with Bingen on the other side. When you get to the top you may have noticed the big statue that kind of looks like a small version of the statue of liberty, German version of course. It is Niederwald Denkmal. A statue Kaiser Wilhelm I made in 1871 to mark the foundation of the German empire after the war. It is really beautiful and the view from up their is amazing as well! Now the sporty part comes! There is a 5km walk though a forest. There is a longer way around in the forest, if 5km is too short for you. There are signs on the trees where you have to go, so you can basiclly not get lost in there. There is an old hunting lodge in the forest where you can get something to drink or eat, if you feel like it. You can also buy a pack of deer feed in an automat and try to handfeed the deers. They are so cute! They drool alot though. The railway on the way down is not a cabin but a simple wooden chair with a safety equipment so you can't fall down. But if you are very afraid of heights, you may have to walk down. You will end up the neighbor town Assmannshausen. They don't have must activity but as every small town in Germany they have a few restaurants, so if you need something to drink after your walk and the hunting lodge wasn't something for you, there is hope! In Assmannshausen you take a boat/cruise back to Rüdesheim. Fear not if it is sailing the wrong way. You will just get a longer trip, but you will end in Rüdesheim at some point. While sailing there is also a chance to get something to eat and drink! This is not just in Rüdesheim, but along the Rhein. 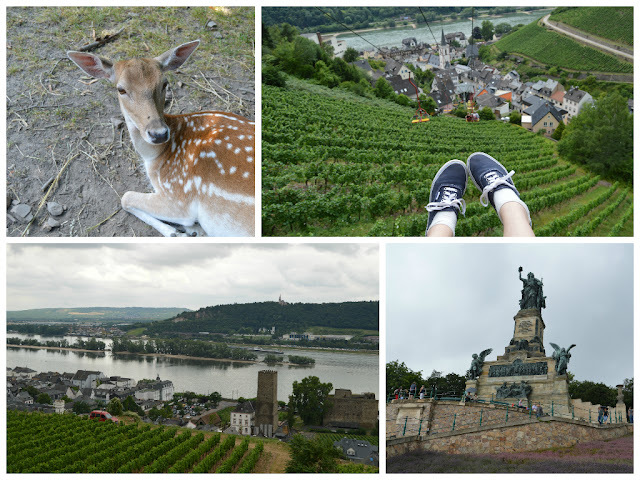 It is not a secret, that most of the way up and down the Rhein, is as beautiful as Rüdesheim. Rüdesheim is just a town with a lot of opportunities, now that is it a lot bigger, that many of the other town along the Rhein. If you drive north from Rüdesheim (the way the rhein is running) there are alot of castles around. Some more maintained than others. The first of them was build by the ancient Romans, back when south Germania was a part of the empire. They were used to get duty from those who transported goods by ships. There is so many castles, that i believe it must have been an very expensive way to use. Others were build by rich people after 1000th like nobility, bishops etc. One of my favorites is Burg Rheinstein. It is build in 1300th and is very maintaind as it was back then. It have been used to many different things though time and you can experince it all, if you visit it. Today it mostly for tourists and for weddings for people who want a oldfashion fairytale wedding. 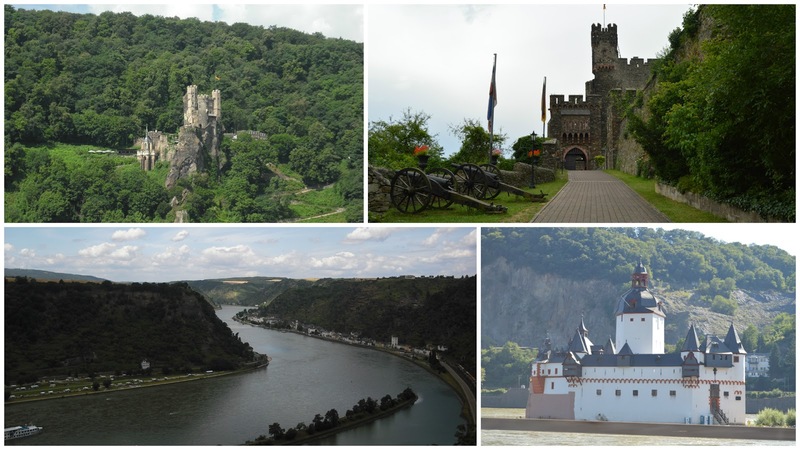 It is a part of UNESCO Cultural Heritage "Upper Middle-Rhine Valley". You can find a list of all the castles and their history here.